It's just a pilot study, but some interesting findings. First the surprising (at least to me). According to the paper, 30% of adolescents skip breakfast every day and as many as 60% skip breakfast 3–4 times per week. While there are no hard and fast rules around breakfast (meaning some people do well with it, and some do just as well without it), that the majority of teens skip the majority of breakfasts I find a bit shocking. This small crossover study set out to compare the impact of a 350 calorie "normal" protein breakfast (13g), vs. a "high" protein breakfast containing the same number of calories, but with more protein (35g). The normal protein meals were breakfast cereals with milk, while the high protein meals were egg and pork based. The test subjects were 28 habitual teen breakfast skippers (avg. BMI 29.9) and the primary endpoint that the researchers considered was glycemic (sugar) control by way of 24 hour glucose monitoring. The reason the researchers cared about sugar was the fact that prior studies had found associations between breakfast skipping and risk of developing type 2 diabetes. The researchers found that when consuming high protein breakfast, the teens' peak glucose readings and the time their blood sugar levels spent above its high limit were lower than after the normal protein breakfast. Breakfast is a funny thing in that it seems to inspire very strong opinions about its worth or lack thereof as it might pertain to a myriad of things - obesity, attention, hunger, and more. 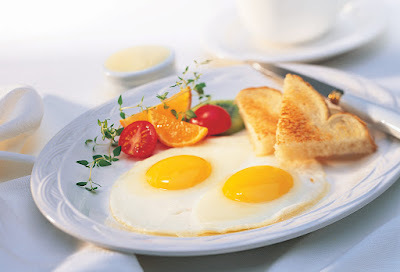 My experiences with patients demonstrate that for the many, if not most, breakfast, especially high protein breakfasts, help with fullness and dietary control throughout a person's day and evening. If you're curious about whether or not a high protein breakfast would benefit you, perhaps the easiest thing to do would be to experiment and to keep track of how you feel on days you have one, vs. days you don't.